When it comes to investing our money, it's critical that we have a good understanding of what different options are out there for us. More importantly, educating ourselves on these options, whether we use a financial planner or not, is important because at the end of the day it's your money. You should want to know what it is doing, what it is making you and if it's not what other options are out there for you. While we are big proponents of putting money into real estate, I'd be lying if I said that's the only place we invest our money. As important as it is to diversify your rental portfolio, it's as important to diversify your entire investing portfolio. In this episode, Emily asks Kirk (the Finance "dude") many different questions about investing in rental property vs. other asset classes like: stocks, equities, bonds and cold hard cash. Using the article, Real Estate vs. Stocks: Which has performed better over 145 Years, as a premise for the discussion, Kirk shares insights into the various investing paths including pros and cons of each. 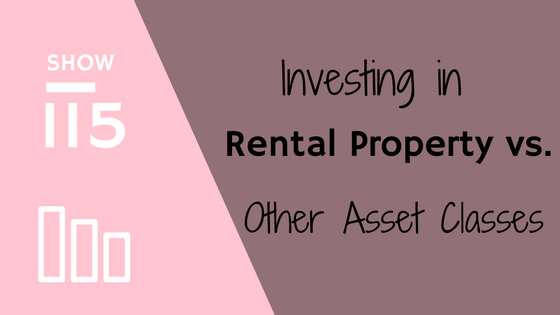 We even question whether rental property investing is worth it in the discussion? So tune in to see what we decided!